The problems of commenting are universal! I find it almost impossible to comment on WordPress blogs. Time and time again when I press ‘publish’ my comment disappears without trace or is instantly binned as spam. SO frustrating do I find this, that I have almost given up either commenting or trying to enter WordPress based challenges – ie the WordPress Weekly Photo Challenge, on which I am UNABLE to post my link. This is a shame. It has also posed a problem on the school 100WC. My comments are only recognised if a comment I have left is fished out of the spam bin and ‘instated’ in the comments column. Thereafter, generally, I have been ‘recognised’ on that particular blog and my comments ‘allowed’ to appear. I don’t know how to overcome this problem – people don’t look in their spam bins and are unaware that someone has tried to leave a comment.. Sometimes I leave comments via Facebook, but it’s annoying that leaving a comment isn’t a simple business. I wish Blogspot and WordPress would talk to each other and sort this out. I have left comments on the Blogspot forum, and beg WordPress users to do likewise (you are missing out on lots of comments at the moment! ), or send an email to WordPress if you are lucky enough to have contact details. There seem to have been a lot of additional problems commenting recently. WHAT IS GOING ON?! I thoroughly enjoyed all your Alice adventures as I have at last got back into my commenting groove. Some of you had read the instructions that included a hint for this week.Others did not and will find this week – well fun! Using the last ten words as the prompt you write your piece. The prompt can be anywhere in the piece but must be complete as it was in the original. If you didn’t take part last week, choose any entry to use the last 10 words from. The link will stay open for two weeks and will close on 16th April. As you have more time, if you would like to do more than one piece feel free to choose another entry to do. If you are new here read ‘What is 100WCGU?’ Hopefully it will answer any questions but do get in touch if you need some answers. Click here to enter your link and view this Linky Tools list. I will transfer it back to this page as soon as possible. Is it Harry who is falling now? Hi, first time at this here so I guess I’ll wait for next week (this ones almost over anyhow) since I didn’t have an entry last week so the prompt can’t apply. Reblogged this on Irene's Words. Until the problem is sorted out, I guess the only thing we can do is to go and mark them as «Not spam»..
Pingback: 100-Word Challenge: Such Wondrous Adventures | Even More BonusParts! I have a wordpress account but I find I cn not comment on blogspot accounts! Is there some kind of conspiracy as it is usually the captcha code that stops me as it will not accpet whatever I put in! Thanks for posting that, Julia. Hope it helps. It is all so frustrating. Even more frustrating, I have already tried to leave this comment once, so maybe it’s in your spam bin! Commenting ought to be much easier, really! By the way, the links I included in the last para of my comment which you have posted in red haven’t transferred, so if you can’t find them to include, maybe just delete the last para. I don’t have any problems leaving or receiving comments on WordPress, but sometimes leaving them on Blogger can be a total NIGHTMARE. The word verification thing NEVER works and is a complete pain in the neck. As for WordPress, I have my settings set that when a “new” person leaves a comment I have to moderate it but when they come to leave a comment subsequently, it is automatically moderated and published straight away. I do check my spam filter and have to say that WP do a magnificent job of weeding out the spammers from the “awaiting moderation” comments. I think so far I have only had one comment that was mistaken as spam when it was from a genuine blogger, which is great. WordPress all the way for me! I have a google account and host my blog at blogpress. I also have a wordpress account, which probably makes things a bit easier. I do not have problems reading or posting to wordpress blogs and comments seem to appear OK. I have word verification off (if you find I do not please let me know). I do every day check the comments filter on Blog in case a post has been placed in hold because thought of as spam. To the lovely commenter up there in red – I love comments and do try to sift through the spam that I get (for every 100 I think I get 1 proper comment if I’m lucky). If you could comment on my blog then I will make sure you’re there and it accepts automatically. I had one today that looked genuine until I read the whole comment and realised it was too uniform to actually be about the post. It commented about music artists but the commenter didn’t once mention the bands name etc. if you still have trouble let me know – I know it sometimes can be buggy an often just needs a firm kick in the bottom. I have now left a comment on your blog, which disappeared as soon as I clicked Publish! As to your difficulties, it seems you have been tagged as spam along the way and so WordPress keeps assuming. If I’m correct, they need to remove you from a spam list they would have. Not certain though as I don’t know how they work. I’ve now joined so many apps/blogs in order to comment and still occasionally hit a snag. Hope they work it out. I’m a WordPress blogger and I will drop a note to wordpress. I learned early on that a lot of the comments from other blog sites get stuck in spam so I check the spam list every day or two and move the comments where they belong. I say heads up to other wordpress folks that you need to check the spam — and please complain to WordPress. Many thanks for letting us know! I agree about the Spam blocker. WordPress is pretty good at filtering, but I have – once or twice (one nice thing about being a small blog is that you tend to get ignored by the ‘bots!) – noticed a genuine comment being filtered out as spam. Checking the logs will legitimise that particular commenter for the future, at least so far as I’ve found. I’ll also mention to WordPress. By the way, I have a Google/Blogger account, as well. If you have a Gmail/Google account, you should be able to comment, at least at Blogger, using the OpenID function. Somebody else’s 10 words????? AAAAaaaaaaaaaaahhhhhhhhhh!!!!!!! 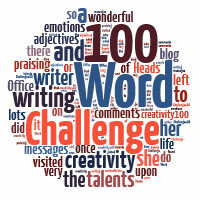 I have a Blogspot Blog and have had no trouble posting this in the 100 Word Challenge or commenting on your posts here on WordPress.